Helps prevent, protect and heal blisters, corns, calluses and sore spots anywhere on the body. Minimizes skin injuries. Gently positions bandages, post-op, wound dressings on tender, fragile skin. Creates an occlusive barrier over warts, poison ivy, other skin conditions. Enhances the absorption of topical medications & creams. Soft & conforming. Pain-free removal, ideal for children, elderly, others with sensitive or at-risk skin. 1 roll. 1 inch x 1.5 yards. Make sure skin is clean and dry. 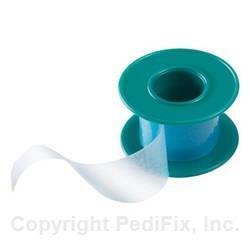 Tear at perforation or cut a piece of Silicone Tape to the desired length. Position over sensitive areas or scars, or around bandages. Naturally sticky. To renew tackiness, wash gently, air dry completely. If you have diabetes or poor circulation, consult your physician before use. If numbness, discoloration or irritation occurs, discontinue use immediately. If symptoms persist, visit a Healthcare Professional.